Everything you want to know about finding your perfect modest prom dress, from picking out the perfect style and color to the perfect accessories. We're pleased to introduce our newest modest formal, Gina. 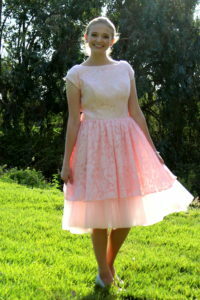 Inspired by a gorgeous, vintage original, Gina is a dress you're sure to wear again after prom! 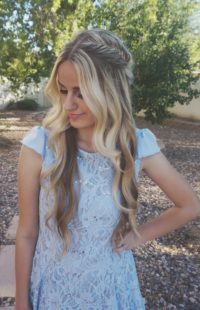 Prom is just around the corner and every girl wants princess-worthy hair to match her perfect dress! Below are four tips to give you inspiration on styles that are ideal for prom, and sure to turn heads. These ten prom hacks will not only simplify and streamline your prom preparations, but save you time, money and hassle in the process! How Do I Order a Custom Gown? One of the things we love best at Virtuous Prom is helping our customers design their very own custom made, one of a kind modest formal or wedding dress. Valentine's Day is around the corner! Whatever your plans or budget are, here are some gorgeously modest dresses perfect for Valentine's Day! With wedding and prom season here, we wanted to provide you with an updated guide to prevent you from falling prey to the many counterfeit websites online. This year's Golden Globes saw a gorgeous array of modest gowns. Many stars chose pink as their hue of choice, while others chose black & white gowns. Selecting the perfect modest prom, homecoming or wedding dress can be time consuming, and oftentimes in the shuffle your petticoat can be completely forgotten. Just in time for homecoming, we're pleased to offer a three hoop petticoat and a ballgown petticoat, along with a brand new tea length petticoat. Homecoming season is here and we're excited to announce that we're teaming up with ModestPop for the ultimate modest dress giveaway.